While many of us don’t think twice about throwing food away, a community non-profit grows, gleans and accepts ‘rescued’ food to feed needy people of South Whidbey. Serving an average of 1,500 people a month, Good Cheer Food Bank receives a monthly average of 4,000 pounds of donated food. The worst cynics may scoff, saying giving food away only enables the poor to rely on handouts. But after visiting the bustling clean kitchen where good-natured food volunteers work together preserving donated and gleaned produce, it’s easy to see the wisdom in using this free resource. 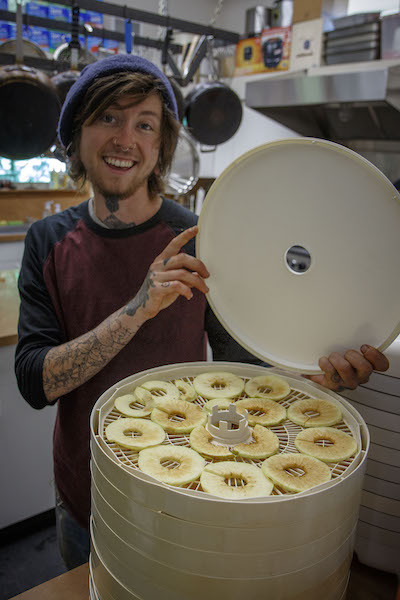 Good Cheer apprentice Grayson dries loads of gleaned apples for Good Cheer clients. The reasons why people go hungry are varied. The Good Cheer Food Bank helps working parents with stretched resources; seniors whose fixed income doesn’t cover all the bills; young people who earn low wages; those who struggle with mental health and homelessness. Squire says leading people to making healthy choices is one way of changing behavior. Good Cheer’s Food Bank helps tip the choice toward healthy eating through its point system. An individual is given a certain amount of points to ‘shop’ at the Good Cheer Food Bank each month. 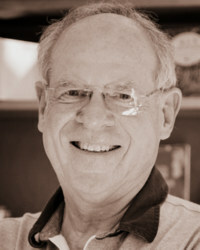 Unhealthy foods ‘cost’ more points than healthy food does, so the decision is made by the shopper. Providing healthy produce for its shoppers, Good Cheer runs the Fresh Food on the Table program whose volunteers work in the garden in front of the food bank and behind the former Bayview Schoolhouse on Bayview Road. 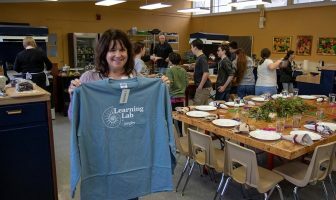 Stephanie Turco manages the garden and winter produce hoop house, carrying on the legacy of Carey Peterson, who went on to manage the gardens at South Whidbey Schools. Peterson and Turco work together to serve more people at less of a cost. 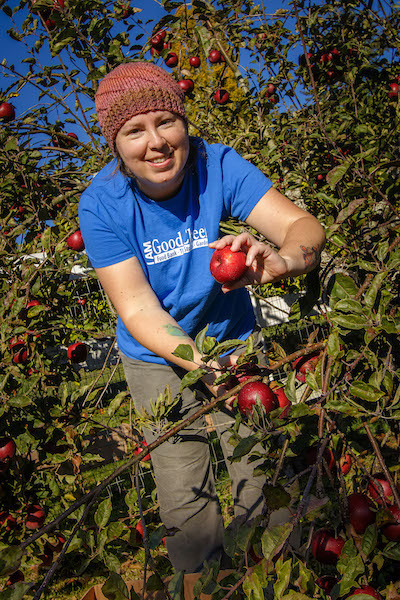 “We get more apples and produce than we can sell at one time,” says Lissa Firor, Good Cheer’s Produce Manager. “So we make applesauce and dry our apples. Last July, there were so many cucumbers. We preserved them. We share our food with South Whidbey Commons, WIN, and others. There’s also food that is gleaned from local orchards and gardens. 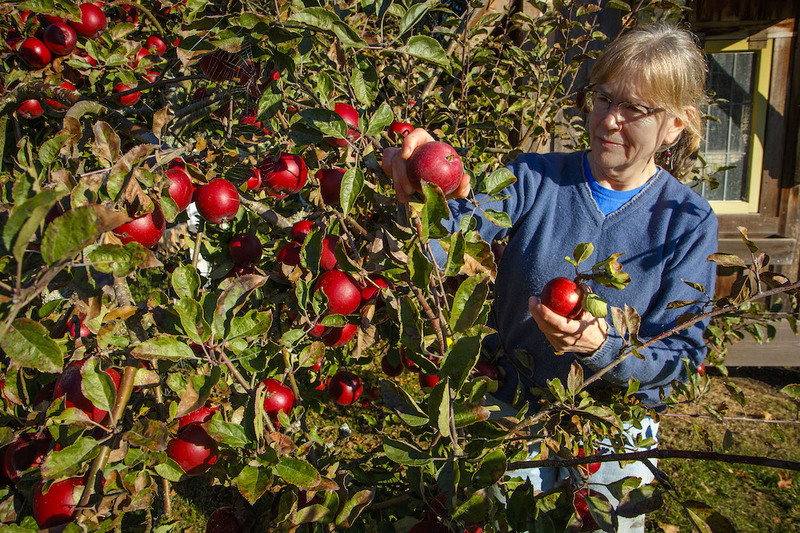 On a sunny day in early October, Brandi Blais, Gleening Coordinator of Good Cheer’s ‘Gleeful Gleeners.’ meets with volunteer Sandy Offelt-Olson (pictured in the first photo) to pick dark red apples from backyard trees. The donors sign up to have their produce picked and receive a reminder email the night before gleaners arrive. “People have been donating for years,” Blais says. Blais arrived in April with Americorp Vista. 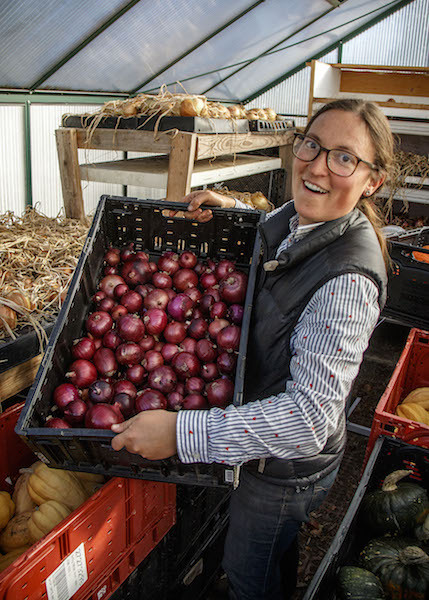 Since then she maintains Good Cheer’s gleaning webpage, maps gleaning locations, manages volunteers and is engaged in building a cold storage unit for all the produce Good Cheer receives. Island grocers: The Goose, Payless, Star Store, Safeway and Haggens partner with Good Cheer as well, donating about 9,500 pounds of ‘grocery rescue’ each month. 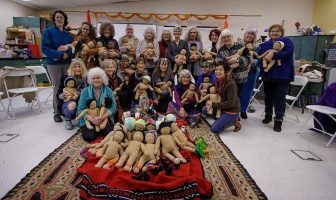 With the help of 200 or so volunteers a month and partnering with other non-profits, Good Cheer is a model of community service that successfully fills a need. But more needs to be done. Good Cheer has been in the business of providing food to the less fortunate for more than 60 years. Sales from its two thrift stores cover 80 percent of operating revenue and recycles things that might otherwise be thrown away. Many a south Islander shops regularly at Good Cheer for quality clothes, fabrics, linens, shoes, furniture, dishes, books and art. 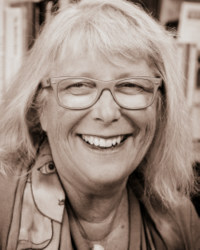 The ‘more rural Whidbey’ points to the fact that with the rural population comes a lack of social service found in more urban areas. These days, Good Cheer remains true to its name as it spreads goodwill. What a wonderful and comprehensive article about an outstanding community organization. I loved learning about the history of Good Cheer and reading about all the people who volunteer their time and skill to the cause.